Small town mystery and veteran's issues collide as retired police chief Samuel Craddock investigates a murder. Right before the outbreak of the Gulf War, two eighteen-year-old football stars and best friends from Jarrett Creek signed up for the army. Woody Patterson was rejected and stayed home to marry the girl they both loved, while Jack Harbin came back from the war badly damaged. The men haven't spoken since. Just as they are about to reconcile, Jack is brutally murdered. With the chief of police out of commission, trusted ex-chief Samuel Craddock steps in--again. 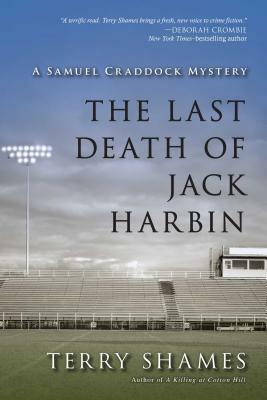 Against the backdrop of small-town loyalties and betrayals, Craddock discovers dark secrets of the past and present to solve the mystery of Jack's death. TERRY SHAMES is the Macavity Award-winning author of the Samuel Craddock mysteries A Killing at Cotton Hill, The Last Death of Jack Harbin, Dead Broke in Jarrett Creek, and A Deadly Affair at Bobtail Ridge. She is also the coeditor of Fire in the Hills, a book of stories, poems, and photographs about the 1991 Oakland Hills Fire. She grew up in Texas and continues to be fascinated by the convoluted loyalties and betrayals of the small town where her grandfather was the mayor. Terry is a member of the Mystery Writers of America and Sisters in Crime. “There may be no protagonist in our genre today as decently compelling as Samuel Craddock. And there may be no better chronicler of the character and complexity of small-town America than Terry Shames." "A Killing at Cotton Hill is the real thing. It has humor, insight, and fine characters. Former chief of police Samuel Craddock is a man readers are going to love, and they'll want to visit him and Jarrett Creek often." "Shames' novel is an amazing read. The poetic, literary quality of the writing draws you into a small town and its interesting, secret-carrying residents." “A Killing at Cotton Hill enchants with memorable characters. . . . A splendid debut by a gifted writer who knows the human heart." "Shames has come up with a sleuth for the long haul.... [Craddock] wins our respect as a guy who stitches together the answers to forensic puzzles with logic and confidence. From page one of the novel, he also claims our affection as a decent kind of guy, the sort we can confidently expect not to disappoint us in future Craddock adventures from Terry Shames’s lively imagination."